Lately, my life has been a bit too busy for being able to keep up with the blog postings like I would like. My apologies for you followers, but I will try to be more on it in the future. 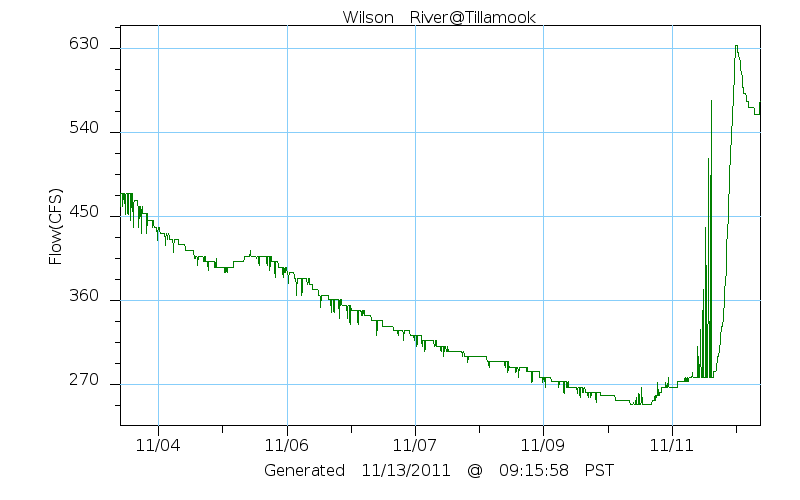 Recently, I have been doing mostly fall salmon, and it has been fair for my report. Some years, the rains seem to hit just right where the fish are coming in fresh, and they are biting hard. Other years lack the rains that raise the rivers up, and the fish tick tack in, and darken up in the tidewater reaches. This year seems to be an amplified version of the latter, and the rains finally have made some of the coastal rivers rise up to a status that would let good fish passage through. The fishing should get good with this blast of rain, and all of the fish that have been showing up later, will be jetting up the rivers. 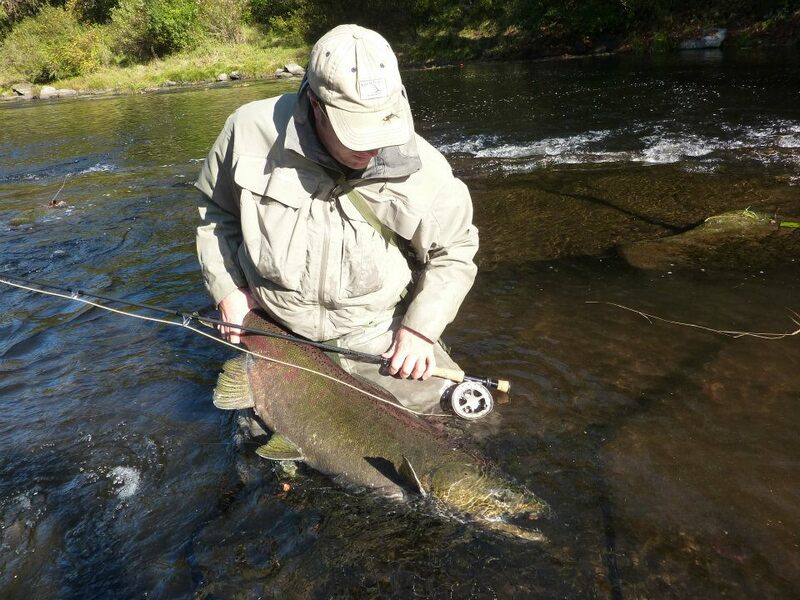 If you have not tried to catch a chinook on your 10wt, then I highly recommend you try it. Some of the days we were picking up fish at a slow rate of one every few hours; while one day recently we saw fish everywhere, and the best and brightest fish were hanging out in the deepest holes. Coho just seemed to really show up in large numbers at one of the systems, and they are stirring up the pools with catapulting airs and lots of rolling around in the larger smooth pools. They can take your fly incidentally while Chinook fishing, and they can offer a great battle with lots of airs and line ripping runs. Some days there can be so many Coho salmon around, and it can make for a tough time trying to get through them to get to the target species the Chinook. Funny problem to have where you are catching a lot of fish, but they are not what you are looking for when you are fishing. I remember many years back; having a day where my friends and I were breaking off Cohos left and right on purpose because we wanted Chinooks, and we could not get past the thick running Cohos. This year that has not really been a problem, but the last time I was out, the Cohos were thick. Soon the south coast systems will be in shape for the famous Chinook fishing, and rivers south of the Umpqua along the coast can be totally amazing if you line them up with the right conditions. 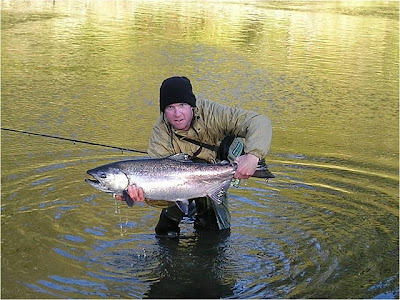 It can be the best Chinook salmon fly fishing on the planet at times, and you can catch chrome bright kings with sea lice on them. Often you can be fighting a fish that is bleeding from a sea lion bight; while you see your size 8 Orange Comet pinned in the corner of its mouth. Crazy!!! Get yourself out there and experience the intense power of a fall chinook. It is like fight a dump truck with attitude, and it is something every fly angler needs to experience. It's Winter Steelhead Time - Officially!